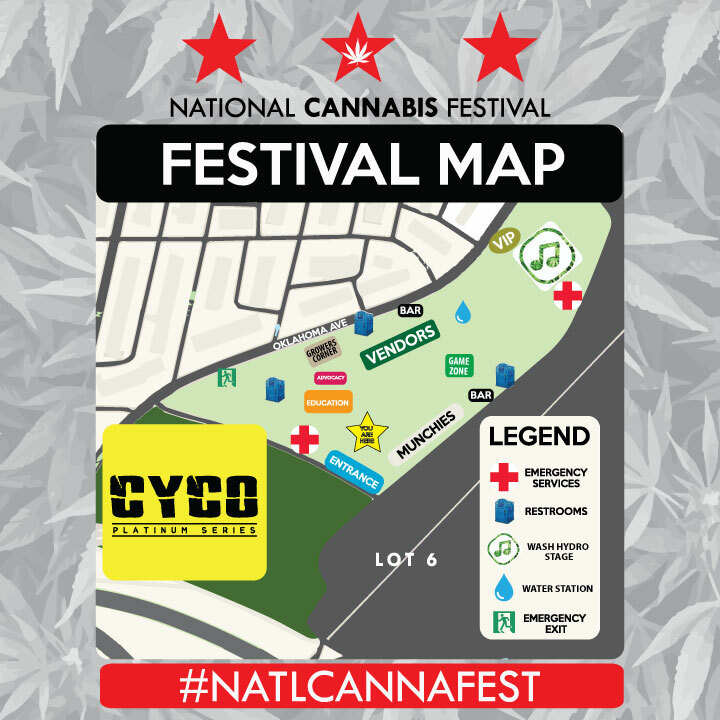 With less than one week to go, we're excited to share the NCF 2017 site map brought to you by Cyco Platinum Series. This year, we've expanded the festival grounds to include more lounge spaces and special experiences. Weedmaps Education Pavilion: Join Weedmaps starting at noon for full day of education sessions ranging from yoga classes and policy discussions to the CannaTank Entrepreneur Contest and CannX Maryland Medical Marijuana Dispensary Expo. Click here for the full schedule. Dr. Bronner's Advocacy Village: Visit the Dr. Bronner's Advocacy Village and meet advocates from a variety of organizations, including, ACLU Maryland, Baltimore Harm Reduction Coalition, Maryland Green Party, Drug Policy Alliance, Marijuana Policy Project, DCMJ, Students for Liberty and more. Click here to meet our advocacy partners. Wash Hydro Grower's Corner: Spend the day learning from home growers, cultivation center operators and hydroponics experts and make sure you're equipped to grow your own. Click here for the full schedule. Vendor Fair: Visit NCF's vibrant vendor village and check out products, games and contests from some of the best in the business, including: Capitol Hemp, Clonex, HTG Supply, Cannabis Energy Drink, Myster, Songbyrd Record House and Music Cafe, General Hydroponics and more. Click here to meet more than 50+ vendors presenting at NCF. Event Rentals DC Game Zone: Jenga. Corn Hole. Moon Bounce. Need we say more? Click here to check out the various Chill Zones planned for NCF17. Munchies Zone: Savory or Sweet? We've got it all. Chicken and waffles, BBQ, Ice Cream, Pizza, Tacos, Crepes, and the list goes on and on. Click here to check out the food line-up. Cottonmouth Bar: Quench your thirst with a variety of beer and wine options. Buy a souvenir NCF reusable 16oz cup or 20oz bottle and enjoy drinks all day. The Dew Drop Water Stop: It's Earth Day and we want you to stay hydrated while not creating a bunch of waste. We invite you to bring your own reusable water bottle to the festival grounds, or buy an NCF souvenir bottle onsite for free water refills all day. Click here to check out the various Chill Zones planned for NCF17. The Wash Hydro Stage: Rock out from Noon until 8pm with our 2017 performers. Learn more about the concert line up and performance times here. VIP Lounge: Find the folks looking for a full year of festival activities hanging out together in the VIP lounge. Enjoy unlimited food and drinks all day and kick-back in our furnished tent when you need a little privacy.